INETER reported that a seismic swarm near Apoyeque started at 1627 on 6 September in an area between the volcano and Managua (less than 10 km SW). At the time of the report, almost four hours after the start of the event, 17 earthquakes had been detected; three events were M 2.3-3.7, at depths ranging from 2.8 to 6 km. No earthquakes were recorded on 9 September. The surface temperature of the crater lake was 28.1-28.8°C on 16 January at 0900. A slight smell of sulfur was evident at the N caldera rim, probably originating from fumaroles 100-200 m below. Fumaroles also remained active in Laguna Jiloa. Information Contacts: B. van Wyk de Vries, H. Rymer, and G. Brown, Open Univ; P. Hradecky and H. Taleno, INETER. Surface temperature of the lake (measured with an 8-14 micrometer bandpass radiometer) varied between 28 and 30°C during fieldwork 8 April. A water temperature measured near the N shore was 25.5°C. Seismic swarms took place during 2001 and 2007. The last overview of Apoyeque (BGVN14:04) reported slight variations of the crater lake's surface temperature of between 25 and 30°C (which began to rise in 1988). Faint sulfurous odors were noted as well as some active fumaroles. Swarms were reported by INETER (Instituto Nicarag?ense de Estudios Territoriales) in a 23 September 2007 report. The first swarm, during January 2001, included earthquakes up to MR 5.2. This swarm was felt strongly in the cities of Managua (~ 8 km away) and in Ciudad Sandino. No damage was reported. The second swarm began on 21 September 2007, becoming more intense on 23 September, by which time there had been 10 earthquakes up to MR 2.8. Scores of smaller earthquakes were also detected at a seismometer in Apoyeque's crater. INETER stated that, based on past cases at this volcano, such swarms can continue for days and might reach M 4-M 5 (as they had in January 2001). The typical pattern is for a series of smaller volcanic earthquakes to precede one or more larger ones. This is in contrast to earthquakes associated with the subduction of the Cocos plate, where larger earthquakes often precede substantially smaller ones. Apoyeque remains in repose without documented historical eruptions. Tephrochronology (the study of ash layers, in this case including radiometric dating) indicates the most recent eruption here was large and took place about 50 BC (? 100 years) depositing the Chiltepe tephra. That tephra deposit has an estimated 4 km3 on-land volume and a total volume (including the offshore component) of about 18 km3(Kutterolf and others, 2008). Reference. Kutterolf, S., Freundt, A., and Perez, W., 2008, Pacific offshore record of Plinian arc volcanism in Central America: 2. Tephra Volumes and erupted masses: Geochemistry, Geophysics, Geosystems (G3), v. 8, Q02S02, doi: 10.1029/2007GC001791. Information Contacts: Instituto Nicaraguense de Estudios Territoriales (INETER), Apartado Postal 2110, Managua, Nicaragua. 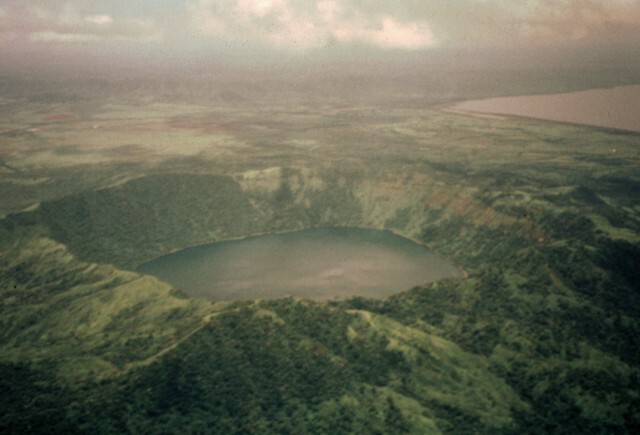 The Apoyeque volcanic complex occupies the broad Chiltepe Peninsula, which extends into south-central Lake Managua. The peninsula is part of the Chiltepe pyroclastic shield volcano, one of three large ignimbrite shields on the Nicaraguan volcanic front. 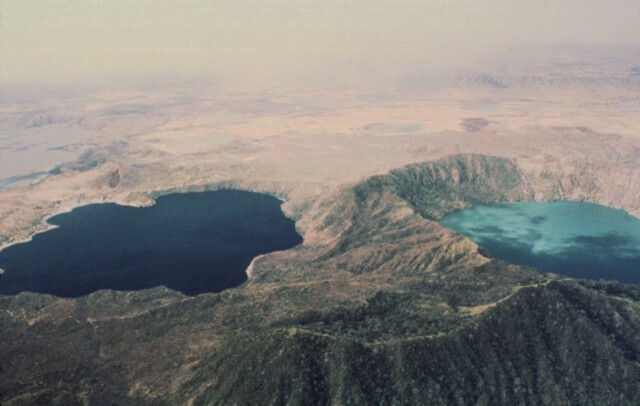 A 2.8-km wide, 400-m-deep, lake-filled caldera whose floor lies near sea level truncates the low Apoyeque volcano, which rises only about 500 m above the lake shore. The caldera was the source of a thick mantle of dacitic pumice that blankets the surrounding area. 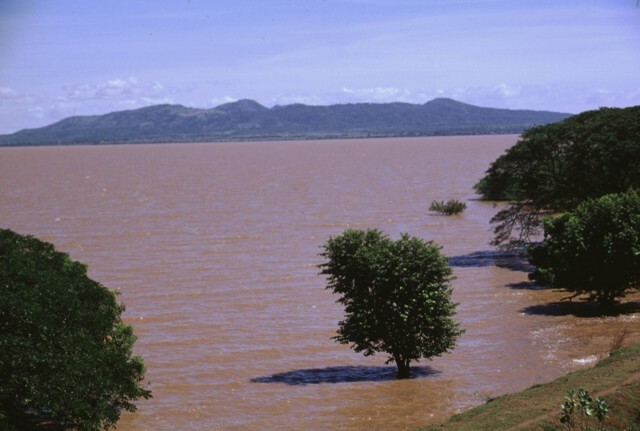 The 2.5 x 3 km wide lake-filled Xiloá (Jiloá) maar, is located immediately SE of Apoyeque. 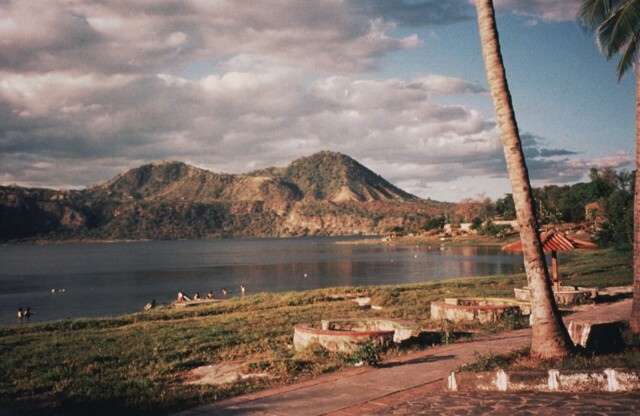 The Talpetatl lava dome was constructed between Laguna Xiloá and Lake Managua. Pumiceous pyroclastic flows from Laguna Xiloá were erupted about 6100 years ago and overlie deposits of comparable age from the Masaya plinian eruption. Bice D C, 1980. Tephra stratigraphy and physical aspects of recent volcanism near Managua, Nicaragua. Unpublished PhD thesis, Univ Calif Berkeley, 422 p.
Bice D C, 1985. Quaternary volcanic stratigraphy of Managua, Nicaragua; correlation and source assignment for multiple overlapping plinian deposits. Geol Soc Amer Bull, 96: 553-566. Freundt A, Kutterolf S, Schmincke H-U, Hansteen T, Wehrmann H, Perez W, Strauch W, Navarro M, 2006. Volcanic hazards in Nicaragua: past, present, and future. In: Rose W I, Bluth G J S, Carr M J, Ewert J W, Patino L C, Vallance J W (eds), Volcanic hazards in Central America, Geol Soc Amer Spec Pap, 412: 141-165. Freundt A, Kutterolf S, Wehrmann H, Schmincke H-U, Strauch W, 2006. Eruption of the dacite to andesite zoned Mateare Tephra, and associated tsunamis in Lake Managua, Nicaragua. J. Volcanol. Geotherm. Res., 149: 103-123. Kutterolf S, Freundt A, Perez W, Wehrman H, Schmincke H-U, 2007. Late Pleistocene to Holocene temporal succession and magnitudes of highly-explosive volcanic eruptions in west-centeral Nicaragua. J. Volcanol. Geotherm. Res., 163: 55-82.
van Wyk de Vries B, 1993. Tectonics and magma evolution of Nicaraguan volcanic systems. Unpublished PhD thesis, Open Univ, Milton Keynes, 328 p.
There is no Deformation History data available for Apoyeque. There is no Emissions History data available for Apoyeque. 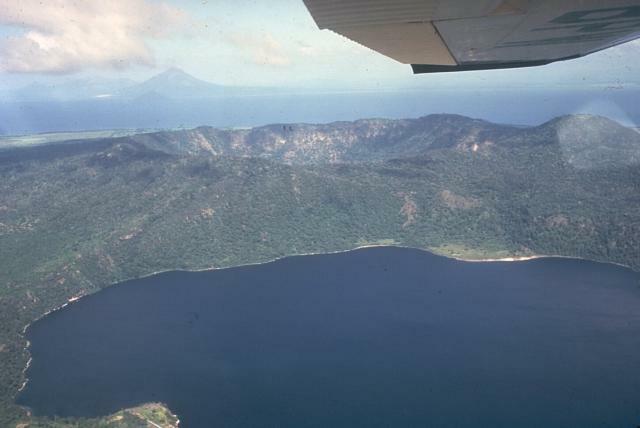 Apoyeque stratovolcano forms the large Chiltepe Peninsula in central Lake Managua. A 2.8-km wide, 500-m-deep caldera truncates the volcano's summit, below and to the left of the airplane wing. Laguna de Jiloa, the large lake in the foreground, lies immediately SE of Apoyeque. The age of the latest eruption of Apoyeque is not known, but human footprints underlie pumice deposits thought to originate from Apoyeque volcano or a nearby vent beneath Lake Managua. Momotombo volcano is visible in the distance to the NW across Lake Managua. The forested Apoyeque stratovolcano is truncated by a 2.8-km-wide lake-filled caldera, seen here from the west. Another lake-filled caldera, Laguna de Jiloa, is located immediately to the SE. Photo by Jaime Incer, 1975. 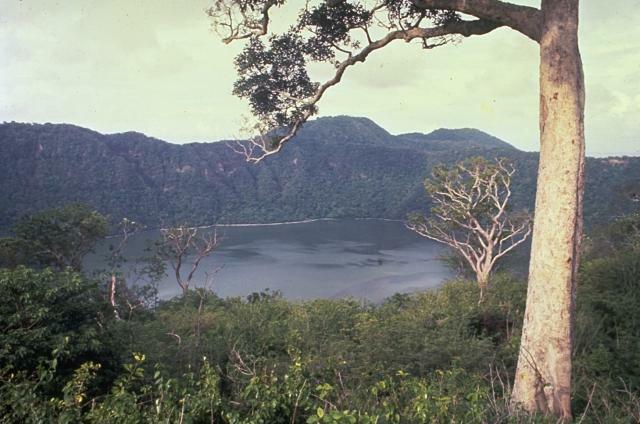 The summit caldera of Apoyeque volcano is filled by a scenic lake. The age of the latest eruption of Apoyeque is not known, but human footprints underlie pumice deposits thought to originate from Apoyeque volcano or a nearby vent beneath Lake Managua. This view is from the west caldera rim with the Chiltepe Hills in the background. Photo by Alain Creusset-Eon, 1970 (courtesy of Jaime Incer). An archaeological site at Acahualinca near Managua exposes human footprints that were covered by voluminous pumice-fall deposits from Apoyeque volcano. The footprints are older than the overlying ca. 6500 yrs Before Present (BP) Jiloa Pumice and may occur within a ca. 7500 yrs BP mudflow deposit from Masaya volcano and thus range between about 6500 and 7500 yrs BP. 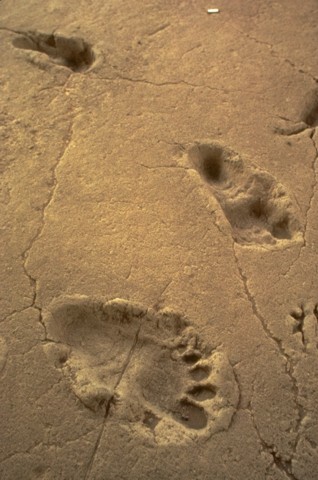 These renowned footprints are the oldest indication of human habitation in the Managua area. The deep blue Laguna de Jiloa (left) and the turquoise-colored Laguna Apoyeque dramatically fill two calderas on the Chiltepe Peninsula north of Managua. The 2.8-km-wide Apoyeque caldera, the source of the major Chiltepe Pumice about 2000 years ago, has a more circular outline than the scalloped 2.5 x 3 km wide Jiloa caldera, which was the site of a major explosive eruption about 6500 years ago. Photo by Jaime Incer, 1980. The SE shore of Laguna de Jiloa is the site of tourist resorts that are popular destinations from the nearby capital city of Managua. The Chiltepe Hills on the horizon beyond the caldera rim to the north are the high points of the Chiltepe Peninsula. 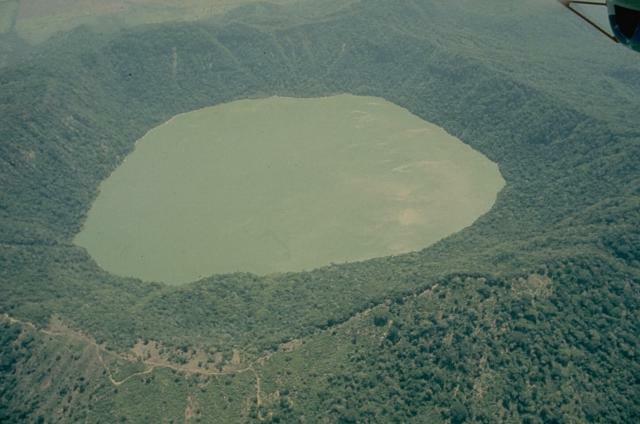 Laguna de Apoyeque fills a 2.8-km-wide caldera constructed at the center of the Chiltepe Peninsula. The caldera rim rises about 400 m above the lake, whose surface lies only about 40 m above sea level. Two major pumice deposits erupted about 18,000-25,000 years ago originated from Apoyeque caldera. The Lower Apoyeque pumice was erupted about 22,000-25,000 years ago, while the Upper Apoyeque pumice, which forms a distinctive layer in the Managua area, was erupted a few thousand years later. Lake Managua lies at the upper right. 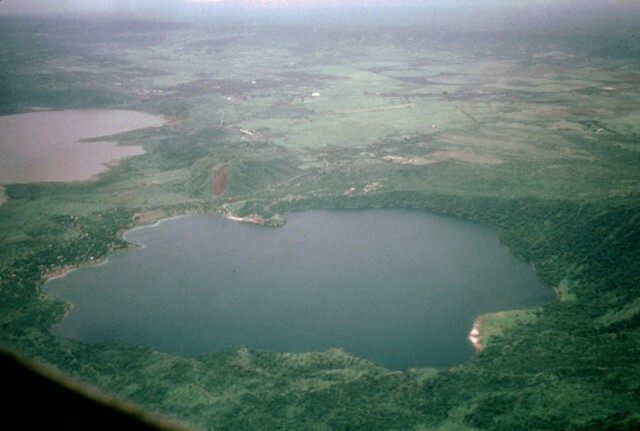 Laguna de Jiloa was the source of a major explosive eruption about 6500 years ago that deposited the widespread Jiloa Pumice, which blankets the Managua area. Laguna de Jiloa (also spelled Xiloa) is seen here in an aerial view from the north with Lake Managua at the upper left. The rim of the 2.5-km-wide caldera is lowest on the SE (left) and rises to 220 m on the NW side. Cones of the Nejapa-Miraflores alignment can be seen extending to the south from the center of the far caldera rim. The broad Chiltepe Peninsula rises to the SE across the flood-stained waters of Lake Managua. Apoyeque caldera lies beyond its horizontal rim on the right-center horizon. The 11-km-wide peninsula extends into Lake Managua and marks the northern limit of a segment of the central Nicaraguan volcanic chain that is offset to the east. 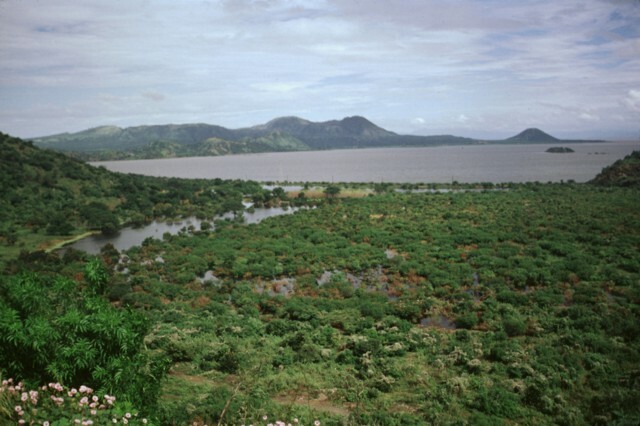 The Chiltepe Peninsula is seen across Lake Managua from the south on the outskirts of the city of Managua. The broad peninsula extends into the lake about 6 km north of the city and lies at the northern end of a chain of pyroclastic cones and craters that extends into the city. The small conical peak on the far right horizon is Volcán Chiltepe. A vigorous steam plume pours from Masaya volcano in this November 9, 1984 Space Shuttle image taken near the end of a two-decade-long eruptive episode. North lies to the lower right, with Lake Nicaragua at the lower left and Lake Managua at the lower right. To the left of the plume from Santiago crater is Lake Masaya (ponded against the rim of Masaya caldera) and the circular lake-filled Apoyo caldera. 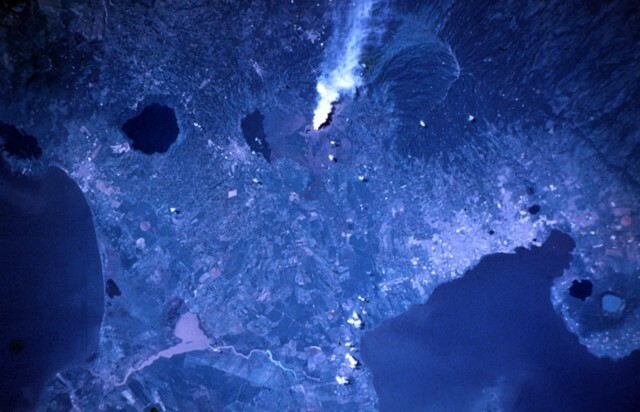 The two caldera lakes at the lower right are Apoyeque (light blue) and Jiloa (dark-colored), across the bay from the city of Managua. Photo by National Aeronautical and Space Administration (NASA), 1984. 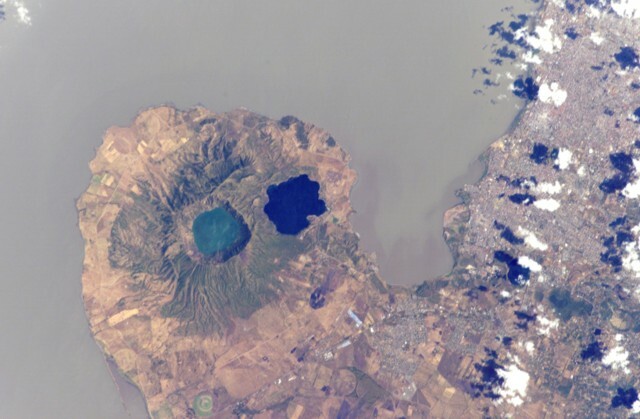 Two lake-filled calderas dominate the 11-km-wide Chiltepe Peninsula extending NE-ward into Lake Managua. Greenish Lake Apoyeque was the source of two major late-Pleistocene plinian pumice deposits, and dark-blue Lake Jiloa (Xiloa) produced the Jiloa Pumice about 6500 years ago. The two calderas cut the summit of the Chiltepe pyroclastic shield volcano. Nicaragua's capital city Managua, extending across much of the right side of the image, has been subjected to major tectonic earthquakes. NASA Space Shuttle image ISS004-E-5765, 2002 (http://eol.jsc.nasa.gov/). There are no samples for Apoyeque in the Smithsonian's NMNH Department of Mineral Sciences Rock and Ore collection. Large Eruptions of Apoyeque Information about large Quaternary eruptions (VEI >= 4) is cataloged in the Large Magnitude Explosive Volcanic Eruptions (LaMEVE) database of the Volcano Global Risk Identification and Analysis Project (VOGRIPA).